Conservatives have been disappointed with the track record of Republicans in Congress since their 2010 takeover of the House. There have been a few bright spots—the cuts in domestic discretionary spending brought about by the sequester, for instance—but from Obamacare to Iran to taxes to financial services regulation, President Obama and the left seem to retain the upper hand. Yet there is one issue percolating in Congress that could provide a rare victory. Conservatives are working hard to take down the Export-Import Bank, and they might succeed. The Export-Import Bank is a New Deal-era relic whose purpose is to facilitate American trade. According to William Becker and William McClenahan, authors of a major study of Ex-Im, the bank has been an “entrepreneurial” institution that has evolved over the years to retain the favor of the nation’s foreign policy establishment and top economic policymakers. Today, its main role is to provide credit to foreign purchasers of American manufactured goods, especially heavy equipment and airplanes. Last year it authorized about $21 billion in government-backed loans. Few of these loans go bad, so Ex-Im has little budgetary impact, but then its critics don’t base their opposition on grounds of budget busting. So what is their complaint? First, the bank is grossly inefficient. To support American businesses, Ex-Im extends credit to foreign governments and enterprises. Surely there is a less roundabout way to promote domestic business than to subsidize foreign business! The Ex-Im Bank’s defenders retort that foreign governments already do precisely this, so Uncle Sam must respond in kind to protect American jobs. Even if this is true (and many experts raise doubts), it does not justify wasteful inefficiency. While some exporters might be hurt if the Ex-Im Bank were decommissioned, its credit could be redirected in ways that bring more bang for the buck. In addition, Ex-Im creates distortions within domestic industries because its subsidies benefit certain American companies over their domestic competitors. Worse, who wins and who loses is determined by the preferences of foreign companies or governments, which may be susceptible to cronyism and other illiberal impulses. Moreover, Ex-Im plays favorites across domestic industries, favoring certain types of businesses over others. For instance, guaranteeing foreign loans for new airplanes may be great for Boeing, but it creates more competition for domestic carriers like Delta, a staunch opponent of Ex-Im. At present, Ex-Im’s benefits flow overwhelmingly to big corporations. Many of its loans go to foreign-owned airlines seeing to purchase U.S.-built planes, making Boeing far and away its biggest beneficiary. In 2013, 30 percent of the bank’s benefits flowed to Boeing. General Electric took another 10 percent, while Bechtel received 7 percent, and Caterpillar took 5 percent. This runs contrary to the claim that Ex-Im favors small business, a group that is politically sacrosanct. Finally, the bank is a breeding ground for cronyism. Major corporations are deeply invested in politics, but not out of civic duty. In 2013, Boeing received about $8 billion worth of benefits from Ex-Im; during the 2013-14 election cycle, it spent about $35 million on lobbying, in part to keep the bank afloat. From Boeing’s perspective, its lobbying investment brought a fantastic return. However, this is inconsistent with republican government. Ex-Im survives not because it enhances the general welfare, but because its clients lobby the government aggressively. Unsurprisingly, all that corporate cash has purchased some very powerful supporters. Barack Obama opposed the Export-Import Bank when he ran for president in 2008, but now he supports its reauthorization. The bank enjoys support from almost all Democrats and many Republicans. Normally, that would ensure survival, but this time conservatives have the upper hand in Congress. 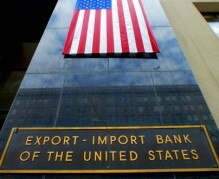 The charter for the Ex-Im Bank expires on June 30. If Congress does not act, the bank will die. It is good for conservatives to take on such a defective program, but there is a larger point about the health of our government that an intensive focus on the Ex-Im Bank risks obscuring. American economic policy is a mess—a tangle of client-patron relationships between government and business that costs taxpayers a princely sum while inhibiting economic growth. The Export-Import Bank is not the worst offender. Rather, it is the easiest to attack. Because it benefits a narrow band of domestic manufacturers, Ex-Im cannot build the sort of broad interest-group alliances that protect other agencies from congressional assault. Moreover, since it requires congressional reauthorization, its critics do not have to overcome our system’s bias in favor of the status quo in order to eliminate it. Instead, it is up to Ex-Im’s advocates to persuade Congress and the president to renew it. And yet, one can only marvel at the struggle over this program. If an agency as questionable as Ex-Im can be eliminated only by a herculean effort, what hope is there of doing away with corporate tax preferences, domestic profits held overseas, onerous regulations that benefit large businesses, farm subsidies, affordable housing payola, rampant overpayments in Medicare, and the like? None of these subsidies will go quietly. All are deeply entrenched in our political economy, not because they are good for the nation, but because the interest groups that benefit from them are the most heavily invested in the political process. Ex-Im, in other words, is just the weakest link in the regime of interest-group liberalism that has slowly come to dominate Washington. For generations the government has been picking winners and losers in the private sector under the guise of national development. Those who have been winning will not gladly give up their spoils. They will do all they can to keep their benefits flowing, and the fight over Ex-Im shows that they can do quite a bit. Conservative reformers who have been fighting the Export-Import Bank should be applauded, but this is not a game of dominoes. If Ex-Im falls, farm subsidies will persist. So will corporate welfare in the tax code. So will our absurd housing policies, which somehow withstood an economic calamity they had helped cause. Politically speaking, the only hope is to get the public involved in the fight against the inappropriate alliance between business and government. Few voters are aware of Washington’s tangled web of crony-capitalism, and this allows it to become entrenched. Thus, Republicans talk a good game about smaller government in their districts, then go to Washington and vote for programs like the farm bill. The folks back home are unaware that this is even under discussion. Interest groups with much at stake win, thanks to public ignorance and apathy. What could change this is strong presidential leadership. To be sure, no president can change the people’s minds at will, and his hold over Congress is fleeting and limited. Still, a determined president can focus the people’s attention on problems they might otherwise overlook and try to force a reluctant Congress to adopt changes. To curb crony capitalism, conservatives will need such a commander in chief. The historical precedent is Ronald Reagan. Corporate welfare embedded in the tax code has been a problem since the 1910s, when the income tax was first implemented. In every decade since the 1920s, reformers complained, but nothing got done because too many interests benefited too much from the way things were. Only when Reagan threw his substantial political muscle behind reform in 1985-86 was the opposition overcome. Today, too, major change will come only if the White House demands it. As conservatives weigh the candidates lining up for the Republican presidential nomination, they could consider the candidates’ priorities. A president has only a limited opportunity to accomplish anything big before his political capital is depleted. Each candidate will promise an endless array of reforms, but the winner will accomplish only a fraction of that agenda. The question for Republican voters, then, is whether there is among those vying for the nomination one who, if elected, would make such a costly investment of presidential effort for the nation’s good.